Walleye Capital of Minnesota: Who Claims the Title? As most Minnesotans know, fishing is a HUGE part of our state’s lifestyle. We cast lines from boats in warmer weather and through holes cut in the ice during winter. Many communities, resorts, and outfitters scattered around the 10,000+ lakes thrive on this pastime. And all those anglers seem to be after that one ever-popular fish, the walleye. The trophy fish is fun to catch and good eating, so much that it was named Minnesota’s state fish in 1965. And while many towns situated near popular fishing lakes claim to be the “Walleye Capital,” who officially holds the title? Let’s take a further look. 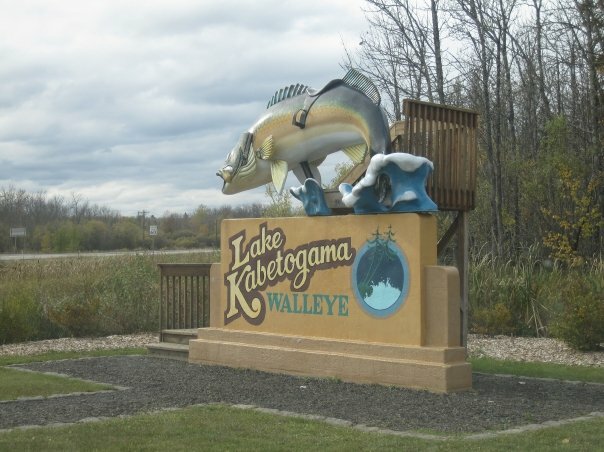 While we have covered Minnesota’s big fish statues before, there are several different Minnesota towns claiming the crown of Walleye Capital. Can there be only one? Apparently no, these towns seem to think. Their rightful claim as Walleye Capital is disputed, but they all somehow live in harmony. One requirement, however, is a giant walleye statue. Here are the contenders. 5. Rush City, MN – Rush City sits between Minneapolis and Duluth on I-35 and has a walleye statue in a roadside park with a sign next to it proclaiming the “World’s Largest Walleye.” This is another undisputed claim, of course. But their 2,000 pound walleye, which purports to be caught by Paul Bunyan himself, does make for a great photo op. The sign lists its stats and one can take a picnic near the monstrous fish. 4. Kabetogama, MN – And speaking of great photo ops, one cannot overlook the saddle-equipped walleye found between Ray, MN and Lake Kabetogama. It’s found across the street from a gas station out in the country in far northern Minnesota. 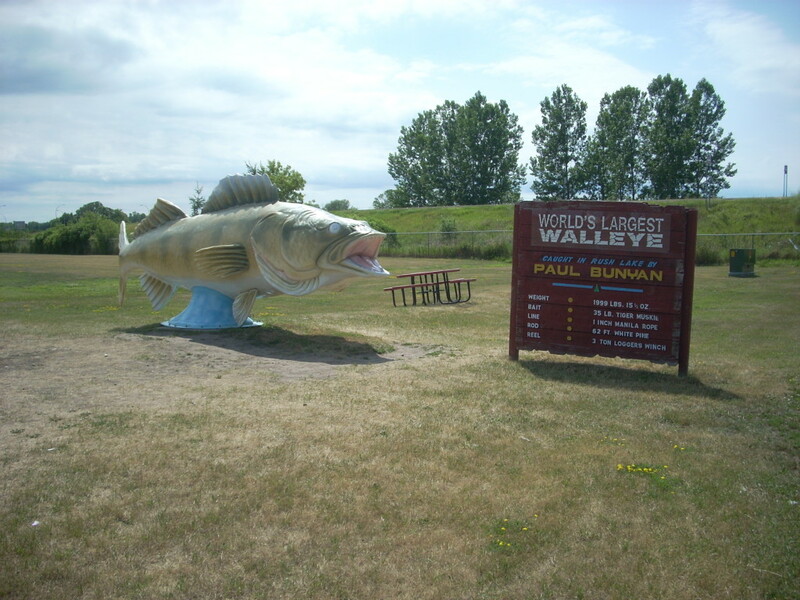 Unquestionably one of the better roadside attraction photo ops, along with Akeley’s Paul Bunyan (and Bemidji’s too), the Kab Walleye as its known, has been around for over 60 years and even graced postcards and t-shirts. 3. Isle, MN – Isle is a classic small Minnesota lake-town on the southern shore of Mille Lacs, Minnesota’s second largest inland lake (Red Lake is first, and Lake of the Woods is partly in Canadian territory). Isle’s big walleye statue used to have a sign below it that read, “Mille Lacs, Walleye Capital of the World,” but this sign has since vanished. 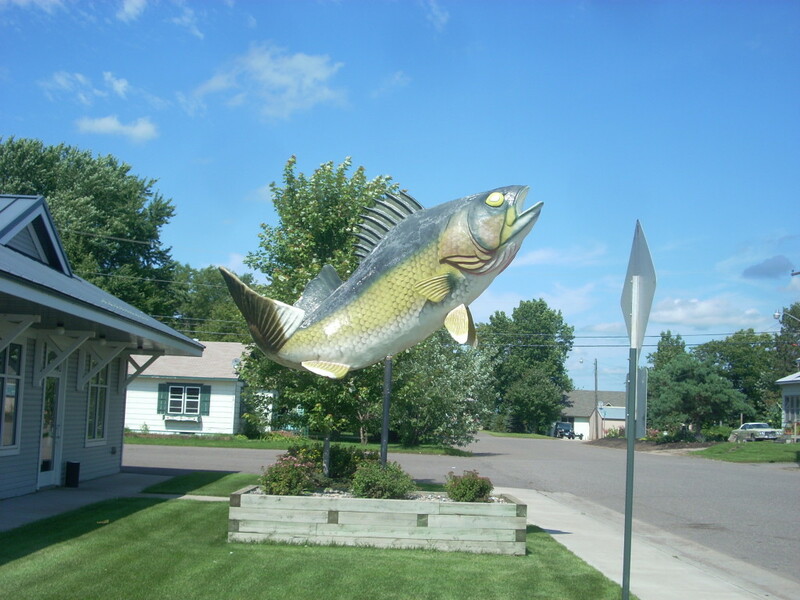 The walleye is positioned outside of a bank, posed in mid-leap about 15 feet tall. As Isle’s sign has disappeared, we’re not sure if they are still in the running. 2. 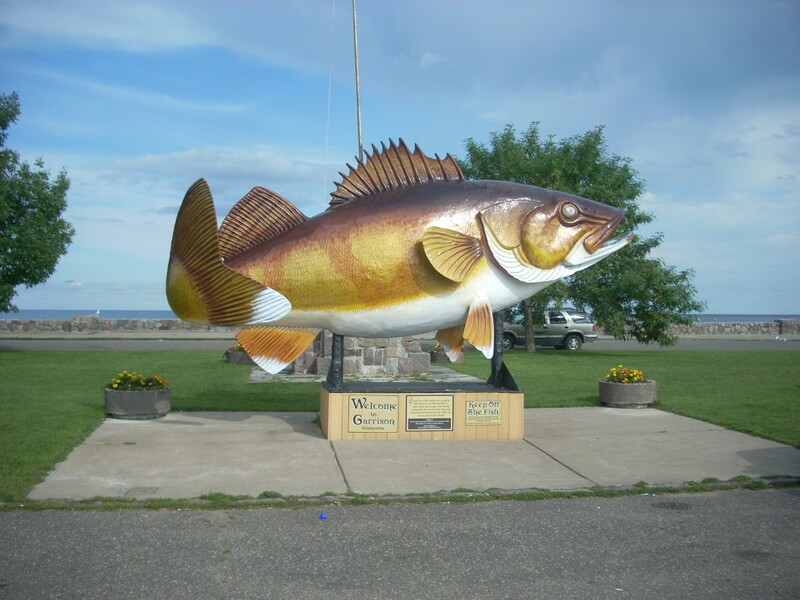 Garrison, MN – Also situated on the shores of Mille Lacs Lake is the Garrison walleye. Garrison’s fiberglass statue, a product of the F.A.S.T. Corporation, sits in a roadside park on the edge of the lake off of busy Highway 169. Garrison makes a pretty legitimate claim, and has the odd curiosity of sharing a name with a town in North Dakota that also has the same fish statue. Freaky. Garrison’s walleye makes for a great photo op and a scenic overlook of the vast body of water in which so many walleye are caught each year. Garrison would likely hold the title of Walleye Capital, if it weren’t for.. 1. Baudette, MN. 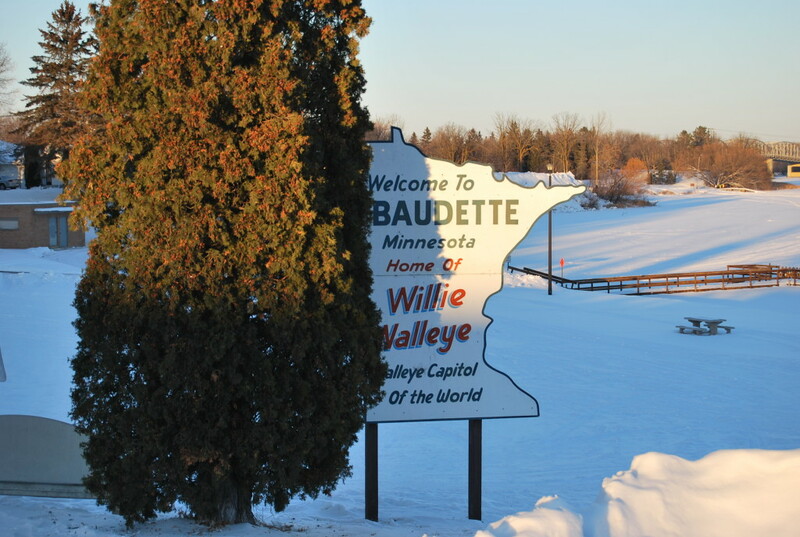 Just south of the Canadian border is the town of Baudette, population 1100. And it’s home to Willie Walleye, found on Baudette’s main street. This heavy-duty, concrete fish monstrosity has been around since 1959, measuring over 40-ft long and weighing in around 2 tons, making it the largest fish statue in the state. The border town of Baudette sits on the confluence of the Baudette River and Rainy River which connects to Lake of the Woods, about 10 miles away. LOW, as it is in known, is the sixth largest lake in the US, after the 5 Great Lakes. 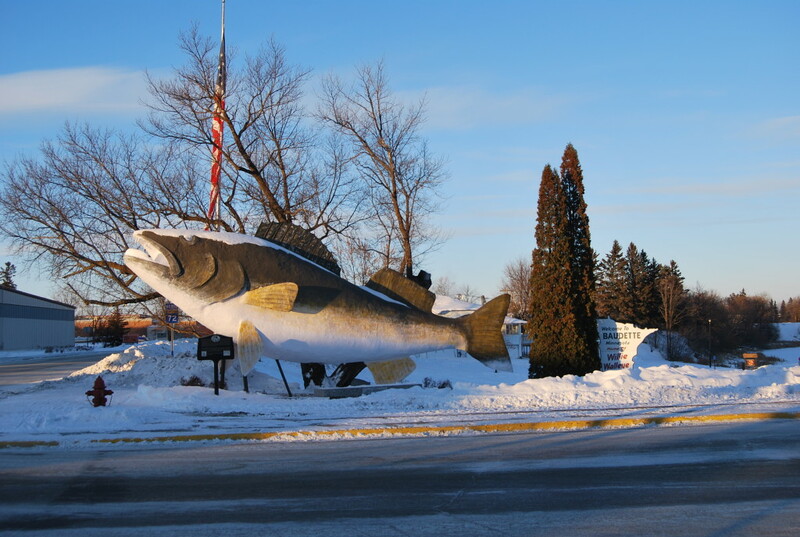 Each June, Baudette celebrates Willie Walleye day to celebrate the great fish. In our opinion, it’s a close battle between Garrison and Baudette, but we’re going with Baudette on this one. Do you agree? Please correct the spelling of my home town. Kabetogama is the correct spelling. Found your website through WCCO. Very nice. Good catch, thanks for letting me know! I have corrected the spelling.